Well, they've put up most of the stone. Here is the look before the grout. The architect/builder, Bob DeFiore from Portico, told me they we going to use buff colored grout to lighten it up. They added the grout. Here it is before it dried. Not very light. The next colossal change will be paint. Bob said the paint will be in tones that match the buff of the stone. The window muntons will be the bronze color you see in the pictures. the window and door trim and the panel - I don't know yet. Stay tuned to Metamorphosis Monday. The string of neighborhoods along the tracks east of Atlanta are delights for architecture tourists. The MLK Historic District, Old 4th Ward, Inman Park, Little 5 Points, Candler Park, Lake Claire, and Decatur define eclectic. The thoroughfares, Moreland, Dekalb Avenue, and McClenden just tease. There are a little pockets of hidden streets that seem from another place or another era: The War Streets, The State Streets, The Park Streets, Southerland Hill. Each has it's own personalty enhanced the the proud and hardy folks who live there. The Lady Streets are Elmira Place and Josephine Street, a couple of blocks east of Moreland Avenue. They are side by side but not exactly a matched pair. Do you need a reason? How about the Inman Park Festival , Little 5 Points, or the original Flying Biscuit. Fox Brothers Bar-B-Q is between the lady streets and worth driving a few miles. The Battle of Atlanta was fought here. If you are in the neighborhood, have a look. 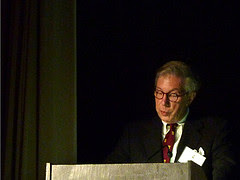 Calder Loth judged and presented the 2010 Philip Trammell Shutze Awards on February 20. These are his notes about the award winners and about classical and traditional architecture. He conveyed the uncanny delight we experience around beautiful design. Thanks to Mr. Loth and to Joni Emerson of the ICA&CA for making these available. "For 41 years, until he stepped down this summer from full-time status as Virginia’s chief architectural historian, (Calder) Loth was paid to care — and brought an unmitigated passion to the role. In the only full-time job he ever held — and as the first person to hold the position — he identified, researched and, importantly, attempted to protect the Old Dominion’s trove of historic places and spaces." And it’s an honor to participate in this happy celebration of wonderful design, a celebration of talent and excellence. *The great Atlanta architect, Philip Trammel Shutze, must have had a very good time. We see him here in his prime, sketching pencils in hand, perched on a window ledge of the Palazzo Venezia in Rome with the column of Trajan beyond. That’s architectural bliss! A fortunate architect indeed. In his practice Shutze had the finest builders, artisans, and craftsmen available. He used the full palette of wonderful historic architecture for inspiration. He had loaded clients who appreciated and understood what he was offering. *He was able to see his finest designs fully executed. He lived to a ripe age, long enough to witness a new generation maintain his tradition of beauty, quality, and imagination. And that’s what we are doing this evening: honoring that tradition and continuing that tradition. The Institute of Classical Architecture & Classical America, through its Southeast Chapter, is proud to affirm the tradition and standards by which Philip Shutze directed his practice by recognizing new expressions of beautiful classical and traditional architecture. Don’t get me wrong, the institute does not seek to engage in a style war with Modernism. We acknowledge diversity and encourage quality in any mode. As in Heaven there are many mansions. We just want to enrich the city on the hill in our own way and we think we have a pretty good way to do it. We have 4000 years of accumulated architectural experience to draw from. And remember: tradition is the wisdom of experience. I repeat: tradition is the wisdom of experience. And certainly Philip Shutze would be proud to know that he’s become the patron spirit of a movement that encourages building on a great heritage. Ok, that’s enough of pumping ourselves up. Let’s get on with the task of the evening; one to the awards…. First, I need to say a word about eligibility for the awards. What is eligible for a Shutze award is a project of a member of the ICA&CA who has an office in the geographic southeast of the United States, and that includes Washington, D.C. . . . Well, welcome to the South, Washington, D.C. That’s an odd thing to say coming from a Richmonder! Also, the projects must have been substantially completed by December 1, 2009. Now, the sponsors and jury for the Shutze awards realize that classical and traditional design comes in various forms, not just in a single building type. Therefore, we have numerous categories for awards, acknowledging the holistic approach to traditional design: from gardens to urban development, to individual buildings. So we start with mother earth, the land. *And in the category of Landscape we have two awards because we have two very different but deserving projects. The first is for the study and enhancement of a historic landscape: Wye Hall, on the Eastern Shore of Maryland. *Wye Hall began as a great waterfront estate laid out in the 1790s. The original mansion burned and was replaced by a Victorian dwelling. That in turn was replaced by a Colonial Revival house. Over the years the integrity of Wye Hall’s complex landscape had been compromised by neglect and later simplification. Using archaeological research, horticultural expertise, ecological respect, and a good eye, the multifaceted character of the property has been reinstated and to some extent, reinterpreted. The property’s resources have been fully documented and vistas restored. Its garden restorations include the *kitchen garden, *cutting garden, *and park. The wetlands and waterfront and other natural areas * have been stabilized through the use of aquaculture and native plants. If only all our historic estates could receive such informed treatment. *Will Jay Graham of Graham Landscape Architecture please come forward and accept our congratulations for this inspiring and sensitive project. *The next award in the Landscape category is for the design and creation of a new garden, for a country estate near Dalton, Georgia. The estate’s prodigious and impressive new Tudor-style mansion has been given a setting where both Elizabeth I and Gertrude Jekyll would feel at home. It’s a blending of the best of English gardening traditions. *The house and gardens are set in park-like grounds that would also be the envy of Capability Brown [see Lancelot "Capability" Brown] . The mansion’s walled garden complex is embellished with *herbaceous borders, *a water feature, *summer house, * kitchen garden, *a library garden, *and fountain section—all forming a veritable mansion of landscaped rooms. It’s been said our most endangered species is a high-maintenance formal garden. We appreciate the owners of this magical place for their dedication to ensuring the perpetuation of an endangered species. You have set a new standard for us to emulate. *Congratulations to Alex Michaelides of Land Plus Associates for the design of this beautiful complex. Please come forward. *Next category: Renovation. In the category of renovation we also have two winners because we had two approaches to renovation that were very different but equally deserving of recognition. The first project more specifically falls into the category of preservation and restoration, and is awarded for the restoration of Redland, an 1852 Georgia raised cottage. *On its new site, a new, properly detailed Greek Doric porch was added to the rear to overlook the garden. *On the inside, new Doric columns were added in the hall to define a dining area. *Missing mantels were crafted based on designs in Asher Benjamin’s pattern-books. *The Greek Revival raised cottage is a signature antebellum architectural type in Georgia. It’s commendable that this important artifact has been given a new lease on life through relocation and sensitive restoration. *Congratulations to the firm of Spitzmiller & Norris for this inspiring project. Will the firm’s principal, Rick Spitzmiller, whom I haven’t seen since he was a student at the University of Virginia, please come forward. *The second award in the renovation category is for a project very different from Redland. The treatment of this house was not so much a renovation as an extreme makeover. We start with an insipid 1950s Doris-Day –style dwelling in an idyllic waterfront setting at Folly’s Cove near St. Michael’s, Maryland. So we see “before” (note the chimneys); and * ”after”: same mass, same chimneys. It’s remarkable what can be accomplished with taste and imagination. *We see the rec room transformed into *a spiritually nourishing veranda. *From a picture window, to a *picture of perfection. *And here is the original entrance that not even a Yankee could love. *To the new entrance façade; a scene that looks so right that you can’t imagine it never being there. *Will Walter Boer of the form of David Jones Architects of Washington, D.C., please accept the Shutze Award on behalf of David Jones, who couldn’t be here, for this magical transformation. *OK, we now come to a category which I consider to be especially important: Commercial. In order to achieve the public’s interest and appreciation for traditional architecture it’s vital that we have projects that can be seen and used by the public. The winner in this category is one that received particular enthusiasm from the jury: Caliza Pool, a bathing complex in Alys Beach, Florida. *As seen in this elegant site plan, the ancient Greek agoras provided inspiration for the layout: and enclosed space with fluid indoor/outdoor relationship. *The architecture itself is hard to pin on particular sources other than exotic—maybe somewhat Mediterranean, maybe a bit North African. Whatever, it achieves its purpose of making you want to enjoy the sun and water as well as convivial warm evenings. *and great lighting; all with an eye towards sustainability. *Receiving the award for this veritable Xanadu is the firm of Khoury & Vogt, Architects, of Miami. Will Marieanne Khoury and Erick Vogt please come and accepted this richly deserved recognition. *We now go to the big picture: Urban Design. We can’t overstress the necessity of maintaining a sense of place in the infill and new development in our historic cities and neighborhoods. It’s difficult to think of a more beloved historic American city than Charleston. And we all are aware of the ongoing debate in Charleston on how to treat new infill. Regrettably, Charleston has been subjected to well-meaning preservationists who parrot the meaningless mantra that new structures should be “of our time”. ‘Of our time’, ‘of our time’, that’s all you hear from them. I’m sick of hearing it. As Steve Semes says: infill in historic quarters should not be of our time but of its place. A primary area of Charleston that desperately needs a fix and a vision for the future is Marion Square, a great urban space framed by historic buildings as well as vacant lots and some real architectural eyesores. Through a visioning process and a knowledge of Charleston’s special architectural character, * the distinguished firm of Fairfax-Sammons has given the city a blueprint for the future, one that can ensure that you know you are in Charleston when you are there. Using photos of historic and existing views alongside *engaging renderings of sensitive infill and remodeling, the city has been given and inspiring *image of what Marion Square could be, a place dripping with character and functioning urbanity. * One infill project is slowly taking shape. We hope to live to see the entire vision become a reality. *Anne Fairfax of Fairfax-Sammons (which maintains a Charleston office), and Peg Moore of Charleston’s Committee to Save the City, please receive our award for this enlightened plan: a Vision for Marion Square. Continuing the commercial theme, the next category is Residential, Multi-Family; that’s translated here to mean *apartment house. But what an apartment house! This is the famed Kennedy-Warren Apartment Building on Connecticut Avenue in Washington, D.C., one of our great monuments of the Art Deco style. It was designed by Joseph Younger and dates from the 1930s. However, construction was halted during the Depression when only two-thirds of the vast complex had been completed. It was supposed to be more or less symmetrical but the right or south wing was never built. *The current project called for restoring the finishes in the public rooms of the original section, enhancing its entrance, and completing the complex according to Younger’s original design, the drawings for which were intact. This seemed obvious and desirable, but surprisingly it became controversial. *When the owner applied for the historic rehabilitation tax credits, the National Park Service said the new addition, the south wing, was too close stylistically to the original building, and therefore the public couldn’t distinguish old from new! Now which public are we talking about? Do you think Joe Sixpack really cares? You need to define which part of the public is your primary audience. The Park Service also said the addition complicated the familiar historic view of the original building, the view lacking the wing. What can I say other than this is the triumph of theory over fact. *An informed person can tell old from new because the historic section wouldn’t have these expansion joints in its masonry. Is that clue enough? Or should we really dumb it down? to suit whom? Anyway, I have visited the site and I’m proud that we can make this Shutze award for an outstandingly sensible and wonderfully executed project. *In fact, I’m not exactly sure which of these interiors are original and which are in the new wing. But I love being fooled. *This prodigious project is the work of the prominent Washington firm of Hartman-Cox. Accepting the award for the firm is Graham Davidson, FAIA. *We now proceed to the meat of this ceremony: houses, beautiful traditional houses. All of like pretty houses, and all of us have fanaticized about living in beautiful, elegant houses. This is a 20th-century house in Richmond. . . . Now don’t we admit to ourselves that if you live in a house that looks like this, man you’ve made it! I have to say, however, that not all new traditional houses are necessarily a good thing. In Virginia, where I’m from, I would guess that 95% of all new houses are in a traditional style, and 94% of them are architecturally illiterate. 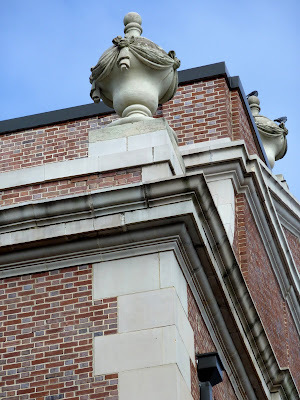 *You know what I’m talking about: the loutish MacMansions where all the detailing looks like it came from Columns R Us. I could go on all evening on the subject of architectural illiteracy. However, I will just quote Andres Duany in saying that the biggest enemy of traditional architecture is bad traditional. Of course the Modernists deride us when they see this sort of thing. If you play the game you have to go by the rules, and teaching and maintaining the rules is the mission of the ICA&CA. OK, that’s enough preaching, back to the awards. It’s heartening to know that in these stressful times we can still produce beautiful traditional houses. Our awards in the category of Residential Architecture come in three categories: small, medium, and large. House photo by Things That Inspire who says the picture is not worthy of the house. *We begin with small; something around 4000 square feet. And this award is for a gem of a house, here in Buckhead. Although it’s titled by its designer as French Provincial, I would say it’s a bit more sophisticated than provincial. I would say that it’s more correctly Petite Noblesse, a kind of Pavillion Intime that you would find on a great estate. *It makes the most of a very narrow lot, hardly wider than the house itself. The poised facade opens into an oval hall *flanked by a dining room, and *a very suave study. *The kitchen makes you want to try every Julia Child recipe. *Beyond the hall is an airy beamed-ceiling living room extending the width of the house. Its French doors lead you to *an atrium-like space dominated by an inviting pool. *At its opposite end is a lounging pavilion that continues your eye to a sculpture and to the wooded backdrop beyond. *The firm of D. Stanley Dixon has given us a dwelling that most any of us could settle in with little hesitation. Stan Dixon, congratulations on producing a mini-masterpiece. Please come forward. de-la-Guardia Victoria Architects & Urbanists, Inc.
*We now move to the medium-size house: roughly 4000 to 10,000 square feet. As some you may know, I’m serving as a co-curator for an exhibition of Palladian drawings opening at the Morgan Library in New York in April. And living in Virginia, I’ve had the privilege to study a number of the Jeffersonian-Palladian houses there. So, under the circumstances, it’s a particular pleasure for me to see an unusually well-informed new interpretation of a Palladian villa, the Ca’ Liza, located on Old Fort Bay in the Bahamas. *In such a place, waterfront is at a premium, so the designers have made the most of a very narrow lot. *In its elevation, one can see references to numerous Palladian-villa designs, but not mistake if for a copy; it’s an original adaptation. In fact, one could slip this elevation drawing into Palladio’s Quattro Libri and few would know the difference. *We have the entrance façade with an integral loggia a la Palladio’s Villa Pisani or Emo. *The ocean side has a projecting portico reminiscent of the Villa Cornaro. *With the tropical climate, one has an airy indoor-outdoor relationship on both sides. *All I can say is that I want to make friends with the owners. What a place to escape from February! *Congratulations to the firm of De la Guardia Victoria Architects and Urbanists of Coral Gables, Florida for creating a work of architecture for which both Shutze and Palladio would be proud. Our friends, the firm of Fairfax-Sammons, has given us another winner with their design for Farmlands, the focal point of a 600-acre wooded estate near Cooperstown, New York—remember, Fairfax-Sammons has an office in Charleston, so this place in New York qualifies. The design incorporates the best qualities of the Colonial Revival style. It draws inspiration from our 18th-century heritage to create a work that is uniquely American in the best sense. We can see references to numerous historic buildings in this otherwise original composition; it particularly recalls the mansion *Woodlands, in Philadelphia, which regrettably is currently a somewhat shabby cemetery office. But what makes Farmlands special is not only its gracious design * but its superb craftsmanship seen especially on its interiors: the library, *with its custom gun case. *The dining room, where the view of Lake Otsego from the Palladian window would make it difficult to concentrate on our meal. *And down to the last detail: the Tower of the Winds order elegantly crafted for the mantel columns. *So congratulations to Fairfax-Sammons for giving us yet another masterpiece. Anne Fairfax please come on down again. *And now last, but hardly least, is a special work of traditional architecture. The second large house, named a Georgian Manor, is not exactly an original composition. In its elevation it is almost an exact replica * of Mount Pleasant, a famous colonial villa in Philadelphia’s Fairmount Park. The point we want to stress with this award is that it’s perfectly permissible to copy: a good idea is worth repeating so long as you do it carefully, faithfully, and with proper materials. How many bad Mount Vernons have we seen? They are what give copying a bad name. Shutze on the other hand was a master at copying in cases where he determined it to be the best approach, especially on his interiors, but he put his own particular stamp on his copies. Indeed, few copies are exact reproductions, including the Georgian Manor we are honoring now. *Mount Pleasant itself is quite small. *The central section of the new Georgian Manor is nearly twice the size in its floor plan. Mount Pleasant also has no connecting wings to its dependencies as the new house does. *The rear elevation is subtly different from Mount Pleasant’s. *The interiors take feature from Mount Pleasant but assemble them in different ways. They provide an * appropriate setting for an important collection of antiques and Philadelphia-style furniture. *So it’s a pleasure to commend David Jones yet again for giving us a neo-masterpiece, one that honors one of America’s great architectural landmarks. So, Mr. Boer please come forward again for David Jones. *We end this ceremony with a look to the future, honoring the promise of what we call an Emerging Classicist. The goal of the ICA&CA is to keep this classical tradition alive and vibrant, and to give us new and beautiful expressions of this classical language. The jury truly believes that we have a real emerging classicist after viewing the portfolio of Paul Knight, a candidate for the 2010 Master of Architecture from Georgia Tech. Here we have samples from his portfolio. *Paul, we look forward to watching your career emerge. Philip Shutze would be proud of you. *Please accept the challenge of the Emerging Classicist award. So now, in tribute to Philip Shutze, will all of our distinguished and talented award winners please stand up and let us give you one more round of applause. It just looks so "from another country." Grady is the most "seen" Shutze building. It's across the street from Piedmont Park after all. Generations of students, teachers, and parents lived some memorable years here. I'm sure folks don't pay much attention though. My 3 children went to school here. We were active parents. This place is part of our life. It started as Boys High. Hentz Reid and Alder designed it while Philip Trammell Shutze worked there. It has his touch. It became Henry W. Grady High School in 1947. Shtuze did a renovation in 1950. It was the first desegregated High School in Atlanta. The original building remains. But it's only about 1/5 of the campus now. So this is what most folks see and it's not very inviting. The "new" gym was of a certain era. You can just spot a Shutze urn over the roof. You might have caught a glimpse from the Charles Allen park gate when you saw Paul McCartney, ran the Peachtree, or did the Dogwood Festival. More likely you've seen it peeking from behind Grady Stadium. The grandstands are "Jetson Brutalist" and getting a renovation right now. The Woody's Famous Philadelphia Cheesesteaks view from the Virginia Avenue hill is one of the best. It's no wonder you haven't noticed this elegant neoclassic school house. It's on a beautiful green with mature trees. And right now, no trailers. You'll never notice the old gym. The architecture is a bit severe but I prefer it to the new gym (see above). Even the breezeway can't hide Grady's high style. The south end is elegant and quiet. The north end housed the offices on the first, the library on the the second. Central cities aren't emptying out any more so Grady is hanging in there, even growing as schools consolidate. Always, there is building and renovation. Here is where the very oldest meets the very newest. I like this addition. It has some very fine detailing. It replaced several less sophisticated buildings. ...and this hill top modern with a Virginia Tech flag. I hope you'll give Grady a closer look next time you are by. See my post about Grady's Shiny Brick. P.S. Here are even more pictures. Here he is: Philip Trammell Shutze ca. 1917 in architect heaven, overlooking Trajan's Column with pencils, sketchbooks, and no doubt a measuring tape. In his day every architect studied classical architecture. Most don't study classics today but they still go to Rome. If you can't draw it pretty, you can't build it pretty. This is Shutze's full sized rendering of a column for the Swan House. It's on The house and the drawing are on display at the Atlanta History Center, the venue for the awards presentation. The same hand produced this, a charming proposal for his own un-built house. In his long, productive career, Mr. Shutze was a match for anyone in his field. He attracted clients who sprinkled Atlanta with remarkable homes, apartments, schools, churches and commercial buildings. It's only fitting that Southeast Chapter of the Institute of Classical Architecture & Classical America named these awards in his honor "...to recognize the excellence of artisans and designers... about the enduring excellence, appeal and importance of traditional design." Enough of that. It's February 20, 2009, time for the Shutze Awards. Let's start the reception. It's a room filled with talent and design lovers. Last year I went on the recommendation of Holly from Things That Inspire, for which I remain grateful. This year Holly and I decided to take the awards by storm. That's Mr. TTI on the left, TTI in the middle, me, Terry, on the right. I never expected to have roof tile epiphany while eating jalipina biscuits. Then I met Rob Wehr from Ludowici Roof Tile. Rob turned me into a raving roof tile fanatic and we know where THAT can lead. Thanks Rob. After an hour of fantastic BBQ, corn chowder, and crab cakes on a stick we gathered in the auditorium. Not a natural environment for architects, designers, or builders. The Bahamas / South Florida contingent from De La Guardia Victoria Architects sat a couple of rows back. They were 2009 winners. Graham Davidson from Hartman-Cox Architects in DC sat right behind me. Hartman-Cox won multiple Shutze Awards in 2009. Elizabeth Meredith Dowling, PhD, president of the southeast ICA & CA, author, and professor at the Georgia Tech College of Architecture introduced the program. She wrote THE book about Shutze." Clay Rokicki, president, Young ICA & CA, Nortre Dame grad and intern at Historical Concepts, introduced the jury. The jury, left: Michael G, Imber modern classical architect based in Texas (that's southern right), right Paul Whalen, partner at A.M. Stern Architects. The final juror also served as master of ceremonies: Calder Loth, author, curator, retired Senior Architectural Historian of the Virginia Department of Historic Resources, serves on University of Virginia's historic preservation advisory committee. Mr. Loth was a gifted MC who presented the awards with wit and wisdom. He's a fellow traveler with the audience. We love this stuff. I hope he'll pardon the paraphrase: "WE WANT TO PARTY AT THOSE PLACES." There is a bit of video below so you can listen to Mr. Loth's wonderful Virginia accent. Finally the winners. If you see any of these folks in your neighborhood things are looking up. You can click the pictures to make them a bit bigger. You'll have to wait for the the professional pictures for the glamor. Paul Gunther, President of the ICA & CA closed the pretension. And another party broke out. I went back to have another look at the renderings before I went home. Calder Loth introduces "large houses"
Here are my Shutze posts, if want to see more of his work. Shut as in "SHUT the door"
P.P.S I recommend American Classicist: The Architecture of Philip Trammell Shutze by Elizabeth Meredith Dowling, Rizzoli 1989. P.P.P.S. Here are all the pictures include a few that aren't in the post above.